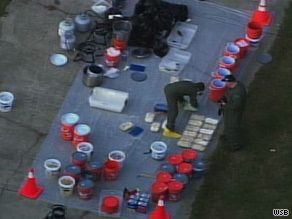 Law enforcement official: Crackdown will affect methamphetamine market in U.S.
WASHINGTON (CNN) -- The Justice Department on Thursday announced 300 additional arrests in a four-year operation that it says produced nearly 1,200 arrests and seizures totaling 11.7 tons of illegal drugs. Authorities look through seized property after a drug raid at a house near Atlanta, Georgia, on Wednesday. Attorney General Eric Holder announced the wrap-up of Project Coronado, which resulted in arrests in 15 states in the past two days. Holder said the operation targeted the distribution network of a major Mexican drug trafficking organization known as La Familia. About 3,000 federal agents participated in the investigation and raids, officials said. Michele Leonhart, acting chief of the Drug Enforcement Administration, said the cartel was known for specializing in the trafficking of methamphetamine and for its brutal violence, including beheadings. Authorities said the arrests made Wednesday and Thursday occurred in California, Colorado, Georgia, Massachusetts, Minnesota, Mississippi, Missouri, Nevada, New York, North Carolina, Oklahoma, South Carolina, Tennessee, Texas and Washington. Dozens of arrests occurred in the Dallas, Texas, area where agents with the Bureau of Alcohol, Tobacco, Firearms and Explosives filed charges against cartel members believed to have illegally purchased and shipped high-powered firearms to the cartel, which was based in the Mexican state of Michoacan. U.S. officials vowed to indict cartel leaders and extradite them to the United States. One leader, Servando Gomez-Martinez, was indicted in New York on Thursday. He remains at large, and is presumed to be in Mexico. A senior law enforcement official involved in the operation, who asked not to be identified, said he was certain the latest crackdown on La Familia would affect the methamphetamine market in the United States for months. "It'll make a difference not only because of how hard we hit 'em, but where we hit 'em," the official said. Another official said during the course of the investigation that labs run by La Familia had been discovered in Atlanta, Georgia, and San Jose, California. To date, Project Coronado has led to 1,186 arrests in 44 months. During that time, agents seized $32.8 million in U.S. currency, and about 1,225 kilograms (2,700 pounds) of methamphetamine, 2,000 kilograms (4,409 pounds) of cocaine, 13 kilograms (29 pounds) of heroin and more than 8 tons (7,200 kilograms) of marijuana.